I still have a bit of a crush on pastels so this seriously pretty colour block dress from yayer had PICK ME written all over it. it comes with cute little cami straps so I can wear it over a white tee if I'm feeling a bit 90's but it's still floaty enough to make me feel rather princess-esque. I nabbed this satin bomber from the aa factory outlet in NYC and I'm still trying to figure out why it was reduced.. possibly because I look like an extra from miami vice in it? who knows.. the mystery continues. I had intended to wear with some dr marten style chunky boots and leather jacket but I threw on my topshop sliders at the last minute ..I wish I hadn't as the little blighters completely skinned my big toe after 5 minutes so I'm sporting a glam plaster/sandal combo, damn you tissue paper feet. I shall be going back for seconds though 'cause I love them.. be gentle ugly beautiful sandals. Love these shades of pastel colours... Your dress is so nice! Lovely outfit, the pastels in the dress are so pretty! 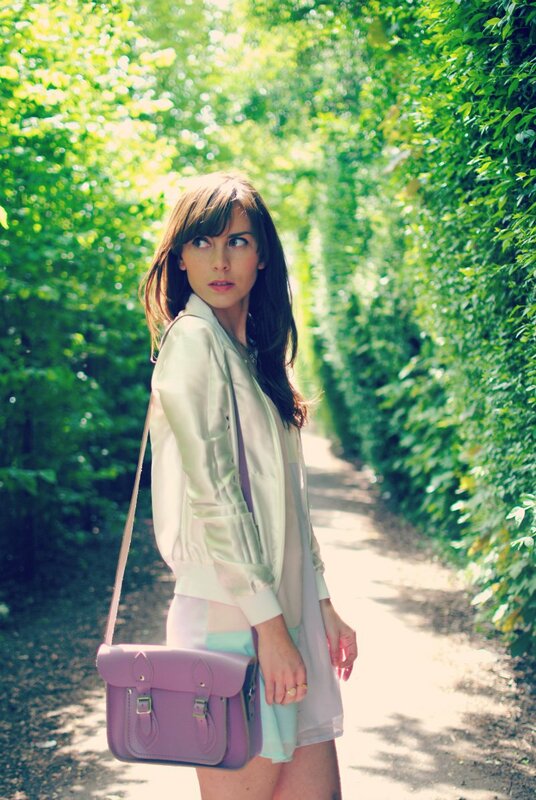 Adore the satin bomber jacket!! Loving the pastels! The dress is so pretty! Love these pastel colours! The clutch is a must-have! A beautiful outfit and I love the photos! Which camera did you use out of interest?